Robert Kirkman's first comic book work was the 2000 superhero parody Battle Pope, which he co-created with artist Tony Moore, and self-published under the Funk-O-Tron label. Later, while pitching a new series, Science Dog, Kirkman and artist Cory Walker were hired to do a SuperPatriot miniseries for Image Comics. While working on that book, Kirkman and E.J. Su created the 2002 Image series Tech Jacket, which ran six issues. In 2003, Kirkman and Walker created Invincible for Image's new superhero line. The story surrounded the adolescent son of the world's most powerful superhero, who develops powers and starts his own superhero career. Walker later failed to meet the monthly title's deadlines and was replaced by Ryan Ottley. In 2005, Paramount Pictures announced it had bought the rights to produce an Invincible feature film, and hired Kirkman to write the screenplay. Shortly after the launch of Invincible, Kirkman and Moore began The Walking Dead , a series set in a world inspired by George A. Romero's zombie movies. Moore, himself struggling to keep deadlines, was replaced by Charlie Adlard, beginning with issue #7. Moore continued to draw covers until issue 24 as well as the first four volumes of the trade paperbacks for the series. Kirkman was first hired by Marvel Comics to pen a revival of the 1990s Sleepwalker series , but it was canceled before being published; the contents of its first issue were included in Epic Anthology #1 . He soon became a mainstay at Marvel, writing the Avengers Disassembled issues of Captain America Vol. 4, 2004's Marvel Knights 2099 one-shots event, Jubilee #1-6 and Fantastic Four: Foes #1–6, a 2-year run on Ultimate X-Men and the entire Marvel Team-Up Vol. 3 and Irredeemable Ant-Man ongoing series. At Image, Kirkman and artist Jason Howard created the ongoing series The Astounding Wolf-Man, launching it on May 5, 2007, as part of Free Comic Book Day. Kirkman edited the monthly series Brit, based on the character he created for the series of one-shots, illustrated by Moore and Cliff Rathburn. It ran 12 issues. Kirkman announced in 2007 that he and artist Rob Liefeld would team on a revival of Killraven for Marvel Comics. Kirkman that year also said he and Todd McFarlane would collaborate on Haunt for Image Comics. In 2010, he also began producing the television adaption of his comic book series The Walking Dead, the pilot of which is directed by Frank Darabont. Kirkman wrote the fourth episode, "Vatos". In 2009 Kirkman and Marc Silvestri took over the 2009-2010 Pilot Season for Top Cow Comics. The 2009/2010 Pilot Season contains a series of five one-shot pilot comics that readers will be able to vote on which becomes an ongoing series. Each series is co-created by Silvestri who also provides cover art. 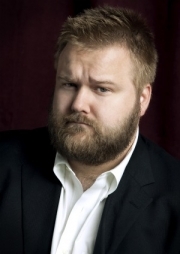 In July 2010, Kirkman announced he would launch and run a new Image Comics imprint called Skybound. Kirkman lives in Kentucky. He named his son Peter Parker Kirkman after Spider-Man's civilian identity, Peter Parker. Whole or part of the information contained in this card come from the Wikipedia article "Robert Kirkman", licensed under CC-BY-SA full list of contributors here.